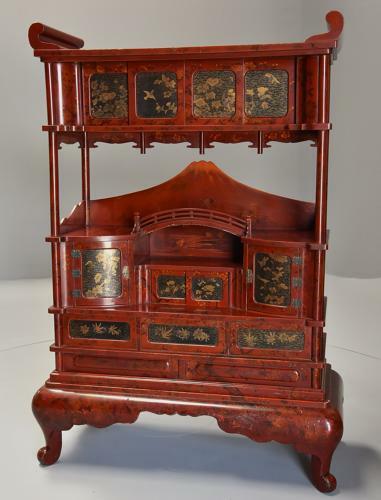 The body of this shodana is finished in a red lacquer with tree, flower, foliate and bird decoration to the front, sides and back making this a freestanding piece, if required. The shodana consists of an arrangement of various sliding doors, cupboards and drawers all with black lacquered background with fine gold and silver decoration of foliate, floral, fruit and bird designs. The top section has four lacquered siding doors leading down to an open shelf section to the centre with Mount Fuji to the back with a bridge infront. This leads down to further lacquered cupboards, sliding doors and drawers all supported on confirming original shaped red lacquered base. This piece is in good, original condition with a few knocks/marks commensurate with age and use, it is of stable construction and can go straight into a home - this is a very useful item for displaying and storing items.